The following information is an adaptation of ideas I found here at SundaySchoolNetwork.Com. 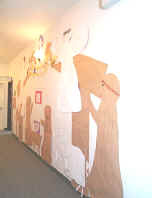 We began with a wall mural in December that is condensed into the Nativity Scene, below. 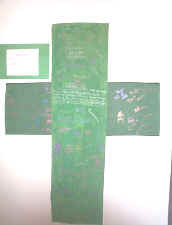 In late January we created our "Old Rugged Cross" and then adapted the "Colors of Christ" Cross Necklace and Poem into seven individual crosses (also described below). The last cross in this series is SundaySchoolNetwork.com's Missions Cross (to be completed in April). 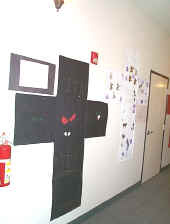 We plan to create this cross in felt and hang it in a prominent place as a reminder to all of us that we need to TELL THE WORLD WHAT HE HAS DONE. Also, as a celebration of completing our study, the children will perform during a service. They will sing "Jesus, Thank you for the Cross," from Family Worship, a song we've been learning as part of our study, and they will talk about each cross as pictures are displayed overhead. This ongoing project has blessed all of us at Living Faith Community Church where I am fortunate to attend and to share God's love with our children. I hope this will give you ideas to implement with your students! This scene is condensed from our study that took place from mid-November, through Advent and Epiphany. * Wise men bringing gifts of frankincense, gold and myrrh. We also remember that without Christ’s death on a Cross and His resurrection on Easter Sunday, we would not have as much reason to celebrate Christmas – Jesus truly is the reason for the season! The cross is the symbol of the ultimate sacrifice that Jesus paid for the sins of the world. 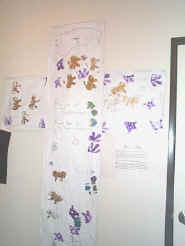 The brown cross was created in the first 2 weeks of our study and shows what we knew about Jesus in late January when we began our Journey from the Stable through the colors of Christ as depicted on the Cross to the Resurrected Lord! This was the introduction to our study of the "colors" of Christ represented in the picture. Symbolizes Christ’s blood shed for you and me. The great news is that God loves you and me and sent his perfect SON, Jesus, to be punished in our place. Gold represents value and worth. The resurrection of Jesus Christ is the event that gives our lives meaning and worth. He is worthy of our praise as we adorn his altar with the color of splendor. Represents growth in our faith. Reminds us of our sin which separates us from God and dooms us to eternal darkness. We have a huge problem! The Bible tells us that we do wrong things, we sin. It is impossible for us to be perfect! Represents the cleansing that occurs when a sinner repents and turns to God. White is the color of purity and completeness. 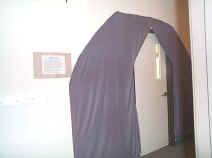 It assists in bearing the message that "though your sins be as scarlet, they shall be white as snow." Christ's triumph from the grave on Resurrection day is the cause for our rejoicing. His purity before his Father becomes our purity. As important as it is that Jesus died on a cross to save us from our sins, the empty tomb is greater yet because Jesus overcame death! He has risen! ALLELUIA! 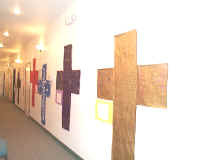 The Missions Cross shows the supreme wonderful act of God. The crown with the three circles depicts the royal throne of God the Father, Son, and Holy Spirit. The earth, God's footstool, is pictured below the Heavens. The 'cross/ladder' is our only way to reach heaven. This is the last cross in our study (to be completed after Easter). Submitted in thankfulness for SSTN!